BY MALIA ZIMMERMAN – Tori Richard Aloha Shirts are proudly worn by Hawaii 5-0‘s leading man Alex O’Loughlin, The Descendants’ star George Clooney, many of the top business leaders in Hawaii, as well as some 2,000 volunteers who worked at the Asia Pacific Economic Cooperation conference from November 7 to 13. The quality of the designs, materials and price makes Tori Richard one of the most elegant and elite Aloha resort wear creators in the islands. 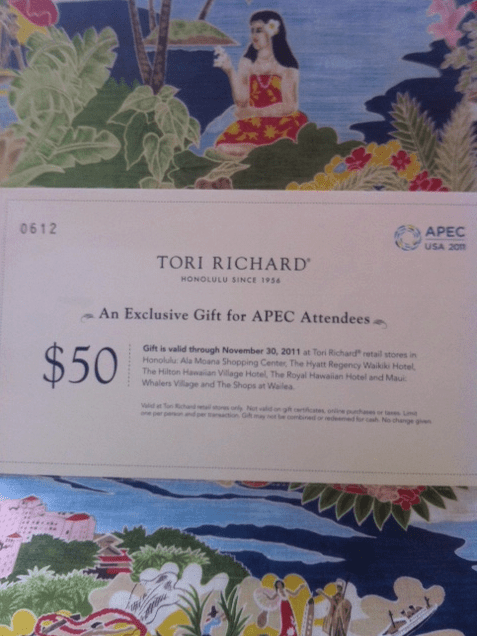 The company sponsored the APEC conference, not only designing the volunteers’ shirts, but also giving every one of the some 20,000 delegates and 1,300 journalists a gift certificate for $50. President Barack Obama’s administration requested that Tori Richard create an exclusive shirt for 21 world leaders participating in APEC for their “family photo” in which these leaders traditionally don cultural clothing best representing the country that is hosting them. Many local residents and business owners were offended when Obama, who touts his local Hawaii roots, made this pronouncement. Tori Richard President Josh Feldman, in response to local and national media inquiries, said on Facebook that he and his 140 employees who worked diligently to design the shirt were disappointed with the President’s decision. “We knew there was some indecision on the use of the shirt but we had felt the Aloha Shirt’s status as a multi-cultural garment would win the day. 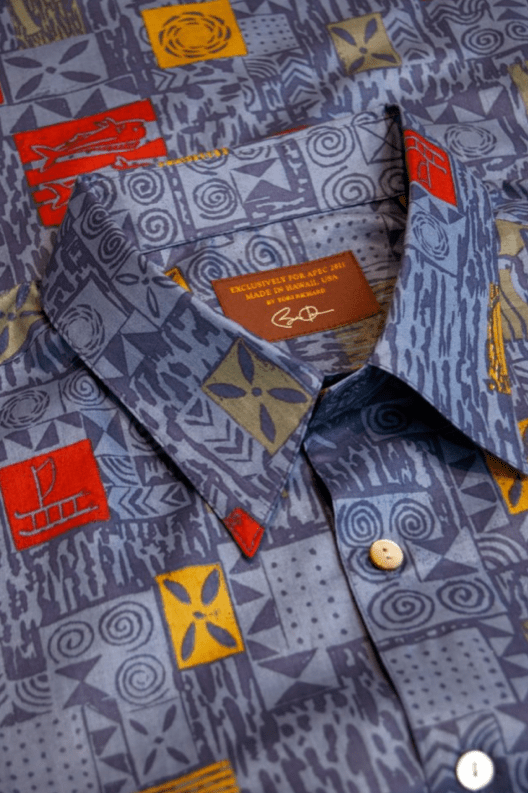 The 75-year history of the Aloha Shirt is strongly colored by visual influences from nearly every APEC member nation. The Aloha Shirt is known throughout the world as Hawaii’s #1 non-agricultural export. It would have been a fitting image of the world leaders to be wearing a garment so influenced by the many nations they represent,” Feldman said. He said print design was “actually directed by the White House” and he said the Obama administration was “quite specific” about what elements should be included. The company went to considerable trouble to “print just 50 yards, enough for 21 shirts” and hand sew each shirt in the Honolulu factory with the “best of materials” including proprietary cotton lawn fabric, authentic mother of pearl buttons, true French seams and custom labeling that read, “Exclusively for APEC 2011 Made in Hawaii USA by Tori Richard” –with President Barack Obama’s signature woven into the label. “The huge effort and cost of a normal printing amortized over just 50 yards resulted in some very expensive shirts,” Feldman said. “We informed the White House who emphasized the shirts needed to be exclusive and one of a kind. This increased our confidence the shirts would be used.” The shirts were donated and no taxpayer funds were used. One of the primary goals of APEC, the President said, was to push for more products to be made in the USA, and exported to other Pacific Rim countries, so that America could boost job creation. Several callers to the Rick Hamada Program on KHVH News Radio on Monday morning shared their frustration with Obama’s decision, calling it disrespectful and offensive. Others pointed to the irony that Obama spoke about promoting American goods, yet “dissed” Hawaii’s own handmade product that could have been showcased so easily to the world. A few callers defended the President’s decision, saying he should have worn a business suit because he is representing America not Hawaii. “I would do it again without hesitation,” Feldman said. Previous articleAtomic Monkey Toons: Everybody Sing! Forget about the snub, I would like the shirt. I also only wear Tori Richards shirts. Nice shirts, of course, but perhaps Obama was just retaliating for Makana’s “Occupy with Aloha” rudeness the night before. Perhaps if only Feldman had been a good party member and incorporated hammer & sickle or a green crescent & star he would have been happy to have wrapped himself and his comrades in such a buttonable flag. How ironic how Obama wants to portray that he is ‘all business’ (this is serious, we aint in Vegas) and yet he was at a Disney resort (Aulani) and he plays golf all the time (and with ‘johns’!). I guess having rap stars at the White House is all about bidness as well. What a great way for Obama to choke, to show his true colors. He dishes out billions in loans and tax evasions to GE, Catepillar and Solyndra while he gives the shaft to small businesses like Tori Richards et al. The Fed is similarly enticing Hawaii out on a limb for a Rail system we will end up footing the bill for. Brilliant. Abercaramba and Car-Liar need to be impeached. What a waste of funds with little ROI but their own photo ops. Long live the king… unless someone bothers to take a serious look at what Art II of the U.S. Constitution both says and means. America is not even a member of APEC, hilarious! APEC has 3 billion customers who will copy and work for nothing and America has 3 million, half with their hands out, guess who snubbed who. APEC kissed Obama and America goodbye and thanks for the free lunch.